Tell us a little about yourself and your kennel. I live in central NH with about 30 siberian & alaskan huskies. I was a professional rock musician before I got hooked on dog mushing, but retired from that career after a few years of running dogs. Now I work as a computer programmer from my home. What introduced you to dog mushing? What was your first experience like? I had gotten a Siberian husky as a pet and was looking for something to do with her in the winter months to keep her exercised. I came across an article about skiing with dogs; more research led me to the sport of skijoring and bikejoring. Then I saw some videos of dog teams in front of sleds and I was instantly enthralled. My thought was to someday have 3 dogs and a sled and just go out for recreational fun. That fall Sleddog Central connected me with a mentor in southern NH, Jim Lalla, who agreed to help teach me the sport. I purchased a beginner sled and on a trip north at the beginning of winter he loaned me 2 alaskan huskies to hook up with my siberian and said, “Ok, follow me.” I followed his team up a fairly narrow, hilly trail that wound through the woods. I fell on every single turn on the way up. I swear, those alaskans knew I was a newbie and plotted to kill me on every tree they could find! I had no idea how to drive or steer that sled, and my little claw brake had zero stopping power for those dogs. We got to the top of the trail and Jim turned his team around to go back down. I thought, “Holy hell, I’m going to die.” I was terrified. I said, “I can’t do this! I could barely get UP this hill never mind down it. You have to take your dogs back!” I was literally shaking in my boots. So he managed to add a section to his gang-line and took his 2 dogs back, and I went down the hill with just my 1 dog pulling me. The whole way down I was so bummed out, doubting that I had what it took to do this sport. When I got back to the yurt where we were staying I went inside where Jim’s wife said, “So how was it?” I told her I did awful, that I didn’t have what it took to be a musher, and what happened. She asked where we went and when I told her she said, “He took you up THAT TRAIL? Well no wonder!” The next day we went to a flatter and wider trail and Jim gave me 4 of his dogs to run with one of his sleds. With a real bar brake. And I learned it was a whole lot easier driving a team with a working brake on a much less challenging trail! Jim taught me a lot that season, and he also introduced me to dog racing. I offered to handle for him at one of the races he did that year and the excitement of the race, watching the teams go out and come back in, infected me. I left that day no longer wanting just 3 dogs and a recreational team - I wanted to race! Describe the dogs on your team. What about them do you enjoy the most? What does your training regimen look like? How long are you on the trail with them? I usually start in August with short runs on the 4-wheeler, keeping it slow. We have a LOT of hills in my area so they get tons of hill training all season. I keep bumping up miles as the fall progresses, and by mid-November am usually doing “camping trips” via the 4-wheeler every weekend or every other weekend, meaning I’ll run the team to a spot on the trail, do a mock checkpoint there and hang out for a few hours while the team rests, then head out again for a 2nd run. If we’re lucky, by mid-December around here I can get on sleds and start really bumping up the miles. But we’ve also had winters where I’ve been doing 40 mile runs with the 4-wheeler in January. Usually I’ll do one or two camp-outs by sled too before the first race of the season, but sometimes I just do back to back runs from the house instead. All depends on trail conditions. I’m very lucky in that I can both fall train and winter train from my yard, but conditions have to be pretty good to be able to sled from here so I’m often driving early winter to get onto trails. In late fall and in winter the length of runs varies widely. Sometimes I’ll go out and do a 15 mile run, sometimes I’ll go out and do a 40+ mile run. So there are days when I’m out there all day long with the dogs, and other days where we do a quick few hours. What do your dogs do in the off season? I have a pretty large play yard I built for them where they can really stretch out and run. It’s got 6 foot chain link fencing and it hot-wired on the bottom so they can be in there all day long without supervision. The rest of my dog yard is split into 5 various sized enclosures, where their houses and tie-outs are. Those too have 6 foot fencing with hot wire on the bottom. So the dogs spend their summers playing all day long in groups of 6-8 dogs in those enclosures, each group getting a turn every few days to be in the giant play yard for exercise. I usually am able to keep running short distances once or twice a week into late May, so they really only have a few months completely off from running. 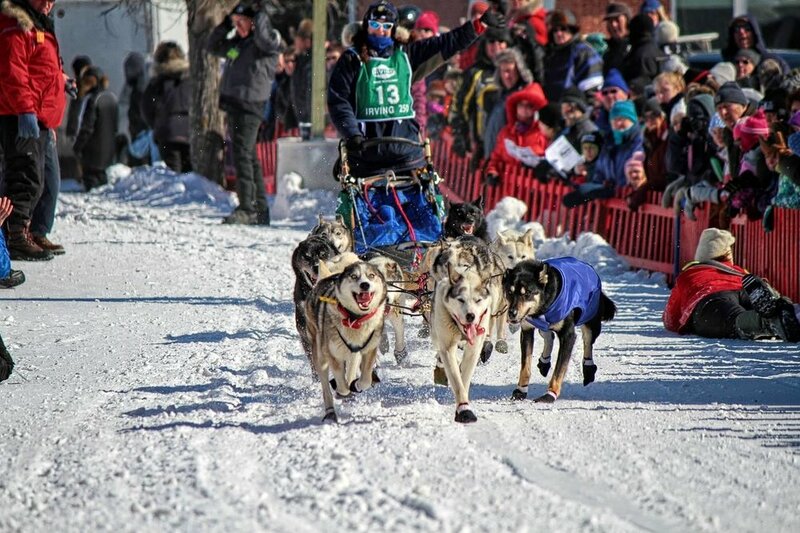 What has been your most memorable experience as a dog musher? I guess there have been two: finishing my first Can-Am 250 race was memorable. That was the first multi-day race I’d done, and I finished it as a rookie. But it was so challenging both mentally and physically. I think I cried for the last 10 miles of it! Then last year, finally finishing the Beargrease Marathon after 3 attempts. That felt like about the same level of accomplishment as finishing that first Can-Am 250. What’s your advice to other mushers? Follow your dreams, whatever they may be. Don’t give up. And be a trustworthy and respectful leader to your dogs. Love them, honor them, treat them right and they will reward you by taking you places other people can only imagine.